Planning a wine tour in Northern Michigan this year? We’ve gathered a few tips to make the most out of your next wine tasting trip from Traverse City to Leelanau or Old Mission Peninsula. • Camera. The wineries are beautiful any time of year, but especially in the fall during harvest season. You’ll want a few pics to remember your trip. • Money. Many of the wineries now have tasting fees. Bring cash to cover fees where you might not purchase a bottle of wine. Each winery’s policy is different. • Snacks. Cheese spreads, breads, crackers and fruit all pair well with wine and won’t spoil your palette for the wines you’ve yet to taste. • Smartphone. The Traverse Traveler app was designed with the wine tourist in mind. This handy mobile guide will help you research, plan and navigate a wine tour in northern Michigan. And best of all, it’s a free download for iPhone and Android users. • “Don’t wear lipstick.” This tip is from Caryn at 2 Lads Winery. It’s not just the marks on the glass that are left behind. Lipstick imparts flavors like petroleum and other chemicals when wine passes over your lips. • No perfume. It ruins your tasting experience, and everyone elses. The scent of one person’s perfume can contaminate the air in a tasting room for hours. • Cigarettes. Your sense of smell is a large part of the wine tasting experience. And smoke is a very stong scent. Like perfume it affects those around you. So please leave the smokes in your car. • Gum. You can’t taste past it, especially mint. So stow the Altoids and TicTacs too. • Dogs & Kids. A wine tour is meant for the 21+ crowd. While you may see a few wine dogs throughout your travels, several of the tasting rooms offer food pairings, which means it’s against their health code to have dogs in the winery. So as a general rule, take the kids and pets to the beach or the park, but not on a wine tour. 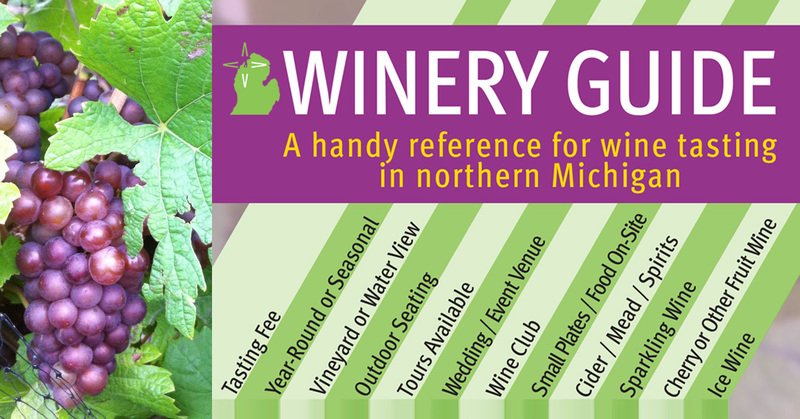 With nearly three dozen wineries in our tip of the mitten it can be a bit overwhelming to figure out where to start. Here are a few tips on planning a wine tasting route from Traverse City. • You can’t see them all. Make a list of favorites, or recommended wineries you want to be sure to visit, and squeeze in others as time allows. • Stick to one peninsula. There are two distinct AVAs in our region: Leelanau Peninsula and Old Mission. Stick to one or the other for a one-day trip. The wineries are scattered throughout each peninsula making it difficult to jump back and forth. • There’s an app for that! Use the Wineries category on the Traverse Traveler app to choose which stops you want to make. The maps are great for navigating between wineries via backroads for a more scenic tour, or finding the fastest route. • Map it. Pick up the large map from the Traverse City Convention & Visitors Bureau. If you’re not a smartphone user this will be a hands-on resource for finding your way around both peninsulas. • Beware of high traffic times. If you’re wine tasting during peak fall season your best days are mid week. If you must come on a weekend be prepared for crowds. Most of our wineries have small tasting rooms with even smaller tasting bars. On a busy weekend you may have to wait to get a turn at the bar. • Go off the beaten path. Most tasting rooms in Leelanau and Old Mission are lucky to be located near the vineyard. But that vineyard isn’t necessarily on a major highway. Part of the fun is exploring and discovering new locations. Start at the top of the peninsula and work your way south. Or make a plan to stay inland and visit some of the smaller boutique wineries. There are some special considerations to planning a wine tour when you’re traveling with a group. Here are some tips to maximize the fun and minimize the hassle when planning a group wine tour. • Size matters. Wine tasting with friends can be a wonderful experience. But if your group is too large it can cause problems which detract from your enjoyment. In our experience a group of 10 or less is the ideal size. Larger groups will have additional limitations on where you can go, how quickly you will move from place to place, and tasting room fees. • Large groups call ahead. For wine tours larger than 10 you should call ahead to each winery. Some tasting rooms are so small they do not allow buses or tours at all, and others have per person tasting fees for the entire party. These are not things you want to discover after you’ve driven across the peninsula to visit. • Label wine purchases. Hopefully your group will discover many wines they like and purchasing bottles at each location. Pick up a box from the first stop. Using a Sharpie marker label each wine purchased with your initials, or used color coded garage sale stickers. Add additional boxes as needed. When the tour is complete it will be easy to determine which wine was purchased by whom. • Pack a picnic. It’s important to eat and drink water throughout your wine tour. For a fun experience pack a cooler with cheese, fruit, crackers and bite-sized appetizers or sandwiches. Many of the wineries have picnic tables or areas outside where you can stop and enjoy your snack along the route. There are also markets and farm stands scattered throughout the peninsulas to pick-up snacks along the way. • Be patient. “Be respectful of other tasters and wait patiently if there’s a crowd,” says Chaning at Forty-Five North Vineyard & Winery. When you’re traveling as a group this is especially important since you may have to break into smaller groups, or taste in shifts. Winemakers and tasting room staff are incredibly knowledgeable about their products and their craft. Here are a few of their tips for making the most of a northern Michigan wine tasting experience. • Chew your sparkles. When tasting a sparkling wine, “You don’t want to drink bubbly like you kiss your grandmother.” If you’ve been pursing your lips when you sip sparkling wine from a glass you’ve got it all wrong. Instead,“Chew, hold and slowly swallow,” instructs Don at L. Mawby. By chewing the wine the bubbles explode in your mouth allowing the flavors to disperse. Try it. It’s a whole new experience. • Eat mild not wild. “Don’t eat strong flavored foods — onion, garlic and spicy dishes — before or during a wine tour,” warns Coryn of Black Star Farms. While a bottle of wine may pair well with some of these dishes, the pungent flavors will linger throughout your wine tour affecting the rest of the wines you taste. • Not a free drunk. Wine tasting is not a free ticket to inebriation. “Don’t treat a wine tour like happy hour at a bar,” reminds Tom at Peninsula Cellars. Guests in a tasting room are there to learn about wine, and are offered tastes (sometimes free) to determine which wines they might like best. If you’re more interested in hanging out at a bar and chatting with your girlfriends, you’ve got the wrong kind of bar. Just be respectful of the staff’s time, and the product that they’re freely sharing so that you’ll discover something you’d like to buy. A wine tour is a great way to explore Traverse City and the countryside in Northern Michigan. With these handy tips you’ll be sure to make the most of the adventure. For more fabulous day trips in northern Michigan this fall check out our post: 22 Reasons for a Fall M-22 Roadtrip. I love my Michigan Wine, but sometimes summer calls for a cocktail. So I decided to share a collection of drink recipes made from Michigan wine, spirits and beer. Cheers! To make this, pour ¾ glass of Black Star Farms Be Dazzled Sparkling wine, and then top off the glass with a little Black Star Farms Sirius Raspberry Dessert Wine. 6oz of a tart lemonade, Simply Lemonade in the refrigerated section of local stores works great. Add a splash of pomegranate, cherry, or cranberry juice. Mix over ice and enjoy. In a large pitcher mix the wine, sugar, lemon and strawberries. Refrigerate for several hours, or up to a day. Add ginger ale just before serving over ice. Enjoy! Mix fruit and cherry wine together in large container, refrigerate. When ready to serve add sparking cherry juice and pour over ice. Mix on ice, pour into a martini glass and garnish with maraschino cherries. Right Brain Brewery Blue Magic Lavender wheat (made with local Lavender from Light of Day organics) or our Citral Wheat (made with local Nugget hops) mixed with Grand Traverse Distillery Wheat Vodka. Mix peach balsamic vinegar and vodka in a glass with ice. Add sparkling water to fill. Serve. In a blender, add the water, lemon juice, mint leaves, blueberries, and sugar. Blend until mixture turns pink. Let sit for at least an hour, then strain to remove blueberry and mint leaves. Add in your vodka, chill and serve over ice! * For a family-friendly option, serve sans alcohol. A nice treat for the kiddos too. * Might I suggest some Moomers ice cream if you’re in Traverse City, or if you’re at the grocery Hudsonville Ice Cream is also made in Michigan. Remember, Buy Local also means Drink Local! Visit your local Michigan wineries, craft breweries and distilleries this summer. One of the area’s most unique wineries is now opening their production area for tours. 2 Lads Winery on Old Mission Peninsula will conduct regular public tours every Monday, Thursday and Friday at noon and 3:00pm. Booking is on a first come, first served basis and accommodates up to 10 people. Cost is $20 per person and includes a vineyard tour (weather permitting), cellar tour and a premium wine and food pairing led by one of the 2 Lads crew in the privacy of our gallery. Taking a tour of one our area wineries is a great way to expand your knowledge of wine making, and discover what makes each winery, and the wines they produce, so unique. That’s why taking a Behind the Scenes tour is one of my 50 Ways to Love Your Summer. The beverage business is booming in Michigan. And everyone from visitors to lodging personnel to locals wants to keep up with what’s new in the world of wine, beer and spirits in Northern Michigan. So here are some highlights from our customers in the industry. 90 lbs of asparagus were grilled and turned into what has become a springtime favorite at RBB: Empire Spear Beer. Don’t worry if you missed it at the Empire Asparagus Festival, it’s on tap at the brewery. And for all the gluten-free customers out there it’s time to send up a cheer for the first ever gluten-free beer at RBB. "Katy Bar the Door" is an ode to the Red Wings #1 gluten allergy advocate, Mickey Redman. It’s made with roasted chestnuts, local honey, and 100% local hops. Just fresh from bottling is the ’09 Riesling at Black Star Farms. The winemakers notes will tell you, "This wine presents classic Riesling aromas of delicate white flowers and stone fruit. Ripe flavors of citrus, peach and apple follow on the palate. It is a lovely off-dry medium bodied white wine." And if you’re looking for a great date night or fun place to meet up with friends, why not check out the Matterhorn Grill at Tastes of Black Star Farms inside the Mercado at The Village. Sit around a miniature grill dining on melted Raclette, meats and veggies will sipping something tasty. Yum. Rim International Wine Competition, held in San Bernardino, CA. Bel Lago 2007 Semi-Dry Riesling won a Gold Medal and the Best of Class award for Off-Dry Riesling, and then competed against all the other Best of Class White Wine varietal winners, and was judged Best White Wine overall. Stop by their tasting room across from beautiful Lake Leelanau and taste for yourself. Congratulations Bel Lago. Despite a challenging ’09 growing season Bryan has pulled together an interesting vintage from their fruits of last year. The ’09 Pinot Blanc is from Island View Vineyard on Old Mission Peninsula. In his own words, "Island View came through again in the tough ’09 vintage. We made the crew sort the grapes into golden and green clusters then the two lots were pressed and fermented individually and carefully blended back together to form this complex bright dry wine. Great apple notes with a striking citrus finish. Very limited production – you snooze you lose." Also check out their Sparking Hard Apple Cider and The Cobbler; a double fermented cider with a cinnamon flavor. Try it served ala mode with Moomers ice cream on the side. Bring on the bubbly. Two Lads is ready to release their 2002 vintage bubbly. "The 2002 Dry Sparkling Wine has been in the cellar doing extended aging en tirage (on the lees). This June will be the last time you will be able to purchase and enjoy this rare and spectacular gem. A non-traditional blend exhibiting an exotic, vibrant bouquet and a seductive mouth feel. When released, this wine will have seen seven years en tirage and is exemplary of Northern Michigan’s potential to be the United States’ preeminent sparkling wine region." With less than 500 bottles left in the cage there’s no time to waste in making a trip up to 2 Lads for a bottle. In case you missed it, Peninsula Cellars was among several local wineries who made the B-list according to a recent article in Food & Wine magazine. The article certainly reinforced the fact that you can’t judge a winery by it’s apparent size or location on a map. And it highlighted one of my family’s favorite easy-drinking reds; Detention. Speaking of easy-drinking, don’t leave this little schoolhouse without a bottle of Homework, their Pinot Noir Rose. If you haven’t been out to visit the George and Kent now’s the time. At their production facility they’ve expanded the tasting room area to accommodate all the new visitors we’re sending their way. You’ll also find some new spirits that will hopefully raise yours. Check out Ole George Whiskey, 100% Rye whiskey now available in the tasting room. I also discoverd a limited bottling of Chocolate Vodka. Sounds like cocktail hour is going to get crazy this summer at Grand Traverse Distillery. If you’ve stepped inside the Cherry Stop lately you can’t miss what’s going on with Uncorked. In order to create two separate spaces for visitors to enjoy they are remodeling and moving the wine bar up front. When they’re finished with the upgrade customers there to visit Uncorked will come in a separate entrance that leads straight to the bar, located under a pergola inside the building. The seating and beautiful Grand Traverse Bay views are still in the back. And plans for another Meet the Winemaker event in June are in the works. So stop in for a sample or pick up a bottle of your favorite local wine while you’re shopping downtown Traverse City. One of the best ways to enjoy summer in Michigan is spending an afternoon at a Wine Festival, or Beer Festival or a combination thereof. So here’s a list of some of the upcoming festivals in Northern Michigan and throughout the state. Love Michigan Wines, Then You’ll Love Uncorked! Did you know that Downtown Traverse City has a wine bar dedicated to promoting Michigan wine, beer and spirits? Uncorked, a Northern Michigan Wine Bar is located on Front Street and you may not have known it was there. That’s because it’s inside The Cherry Stop. And it’s home to an amazing opportunity for you to unwind, unplug and sip on some fabulous cocktails. There is no where else in Traverse City you can step up to the bar and order a flight of riesling for a side-by-side taste test, and be able to walk out the door with a bottle of your favorite label. Whether you want to order a wine sample, sip on a Michigan microbrew draft, or savor a cocktail made from local spirits, the options are endless at Uncorked. The Cherry Stop has been with Mealtickets from the day we opened for business. And we’re very excited to welcome another great idea from Nick and Jamie Roster into Mealtickets service. Stop in for a glass, sign up for one of their Meet the Winemaker events or enjoy happy hour. And tell them we said hello! If your wine tasting tour has never lead you along the western shore of Lake Leelanau then you’ve missed one of the area’s best wineries. Bel Lago Winery, a recent addition to the Mealtickets little card family, sits across from Lake Leelanau with views of vineyards and crystal blue waters. But the vista pales in comparison to the wines. Known for their amazing choice of varietals and blends, Bel Lago has won awards for nearly every wine entered in competition in the last five years! They began planting grapes in 1987 on the family-owned property, and opened the tasting room in 1999. And still it’s amazing how many people have not heard of this diamond on the shore. We’re hoping to change that. So next time you’re headed out on a wine tour, or perhaps you’re picking up a bottle for dinner tonight, check out Bel Lago Winery. You can find a map to their off-the-beaten-path location on our Dining and Wineries page. And take a trip to the website for more information, www.bellago.com. In case you’re wondering, the photo on the card is their view. Not bad, eh? Have you ever wanted to taste wines with the winemaker and compare notes? What if you could sip and savor at home, in your jammies if you like, while discussing Michigan wine with other fans from across the country? On March 8, 2010 you can do just that. Thanks to the folks at Michigan By the Bottle all you need for this fun event are a few bottles of Black Star Farms wines, a computer and a Twitter account. Black Star Farms Winery is participating in a virtual wine tasting with Tweet & Taste Michigan. Created by Shannon Casey the event brings wine bloggers, winemakers, master sommeliers and wine lovers together to learn and share wine notes online in real time. Interested participants can search twitter using the hashtag #ttmi to find all relevant info on Tweet and Taste Michigan. To RSVP for the event find them on Facebook here. The all-folk, all-acoustic festival aims to be bigger and better this year, expanding down another hallway at the southern end of the Mercato and also establishing a new stage at Left Foot Charley. As with last year’s event, there will be a band stage, a duo stage, children’s stage and solo stage, as well as an open mic at Cuppa Joe. Family friendly and free admission…fun for all! NM3, RedHot Marketing and Left Foot Charley are sponsoring a special event for VSA (Very Special Arts of Grand Traverse County.) $50 Ticket includes a Silent Auction, Music, Wine & Food. Proceeds to benefit VSA. For more information contact Left Foot Charley at 231.995.0500. The 2010 Cherry Capital Winter Wonderfest is upon us, bringing fun to our frozen city. And this year it’s bigger and better than ever. New events like the Traverse City Microbrew and Music Festival, the "snowball" softball tournament and the Winter Wine Wonderland, will all add the excitement of this growing festival. This year, there’s something here for everyone; man, woman, child, even dogs! In fact, you can bring your furry friend downtown for the first annual Monster Dog Pull where pooches of all shapes and sizes can test their strength with a weighted sled. If you’re looking to join the festivities you’ll need to know where to go. Events are schedules across Traverse City, but are primariliy located in three areas: Downtown Traverse City, The Grand Traverse Resort & Spa and Mt. Holiday ski resort. For details on all the events, check out the Cherry Capital Winter Wonderfest website at www.winterwonderfest.org. Black Star Farms announces the opening of Hearth & Vine serving dinner to the public Wednesday through Sunday evenings. Black Star Farms, already well known for its award-winning wines and cheeses, is now serving dinner in Hearth & Vine, a vineyard café, at the Suttons Bay farm featuring wood-fired fare in a rustic yet elegant atmosphere. The weekly menu at Hearth & Vine draws on ingredients produced on the farm, including pork and lamb, fresh eggs, 9 Bean Rows hoop house vegetables and hearth baked breads, and of course, Leelanau Cheese Co. cheeses and Black Star Farms wines. It’s truly a celebration of agriculture. From late spring through fall, Hearth & Vine is open daily serving delicious wood-fired pizzas and sandwiches as well as soups and salads. Black Star Farms wine is available by the glass or bottle along with soft drinks, coffee and tea. Lunch and snacks can be enjoyed out on the terrace or indoors in the cozy cafe. On the market side they’re all about local. Black Star Farms farm-fresh eggs and fruits and vegetables from their and neighboring farms are offered seasonally. Pastries, cookies and 9 Bean Rows hearth-baked breads, Black Star Farms maple syrup, verjus and kettle cooked jams and preserves, and the best of other locally produced items are also available. 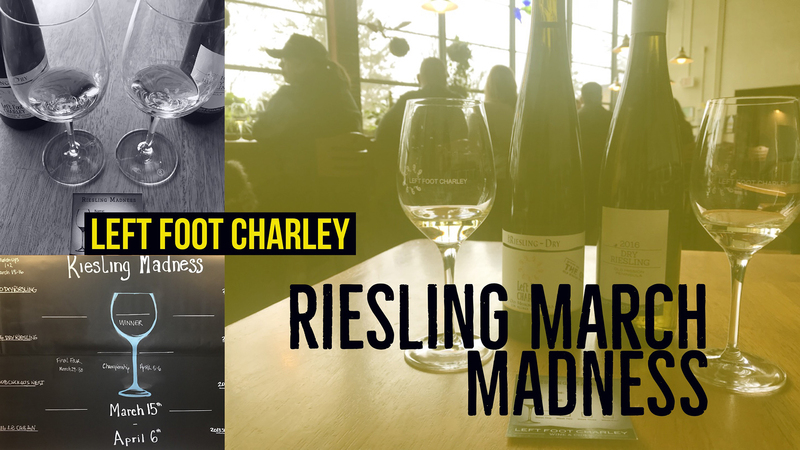 Left Foot Charley Winery partners with Werner and Margrit Kuehnis to share a traditional Swiss meal – a half wheel of Raclette cheese grilled with potatoes, Black Forest ham, country style bread, pickled veggies, fresh fruit and assorted Swiss sweets. Left Foot Charley introduces the 2009 "Gewurzling" on tap. You guessed it…Gewurztraminer and Riesling blended and served *loose from the tank. Additional Left Foot Charley wines to be named later, and hard cider will be included. You will not want to miss this tasty event! (3) an Italian convention describing wine sold direct from tank. Fustini’s Oils & Vinegars is pairing up with Black Star Farms to host a wine dinner this Tuesday, November 17th at 6:30 at Hanna in Downtown Traverse City. Chef Carrie has created a 5 course meal featuring some of the new flavors at Fustini’s. Lee Lutes, winemaker at Black Star Farms, will be on hand to discuss the evenings pairings. Reservations are required. Call 231.946.8207 to reserve your spot today. The five course gourmet meal is $55/person. To view the menu on-line, click here. Check out the video on ABC World News featuring Cornell Oliver, winemaker from 2 Lads Winery. Finally the headlines coming from our state have something positive to say. Next time you’re on the Old Mission peninsula, stop by 2 Lads Winery and see what the fuss is all about. Put on your lederhosen and head to Left Foot Charley in The Village this Sunday October 4th from 12:00 – 6:00pm for the annual Harvest Festivus celebration. Don’t miss the new Hard Cider, it’s back and better than ever. TripAdvisor announced it’s list of the Top 10 North American Wine Destinations, and Traverse City was among them. Taking the top two positions were Napa Valley and Sonoma, California, no surprise there. But coming in a respectable 8th was Traverse City, Michigan. According to a survey of 1000 online respondants, interest in wineries is up 10 percent from last year with 48% planning a trip to a U.S. winery this year. Join Fustini’s owners Jim and Lane for a special meal prepared by Chef Carrie at Hanna Bistro Bar in downtown Traverse City, on Tuesday, September 22nd at 6:30pm. Each course accompanied by Spencer Stegenga’s Bowers Harbor Winery wine. Fustini’s Blood Orange Fused Oil. with Fustini’s Fig Balsamic & Manzanillo Single Varietal Oil Vinaigrette. marinated in Fustini’s Peach Balsamic and Garlic Oil. made with Fustini’s Chipotle and Persian Lime Extra Virgin Olive Oils.